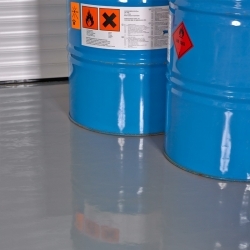 Rust-Oleum B95SL Flexible Self Levelling Epoxy is a virtually solvent free, two component epoxy flooring system, with a convenient 1:1 mixing ratio. It should be used on cleaned, horizontal concrete, asphalt-concrete, or other floors where flexibility is required. 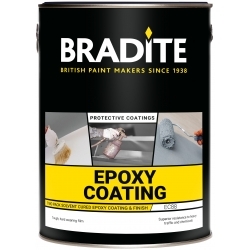 The coating offers protection against abrasion and impact and can be applied up to 2mm thick in just one coat. 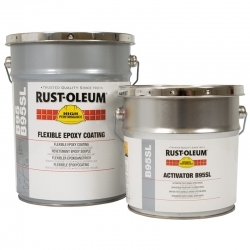 Rust-Oleum B95SL Flexible Self Levelling Epoxy is a virtually solvent free, two component epoxy flooring system, with a convenient 1:1 mixing ratio. 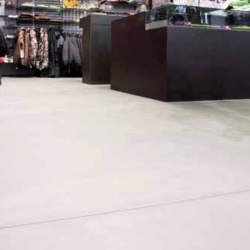 Rust-Oleum B95SL Flexible Self Levelling Epoxy should be used on cleaned, horizontal concrete, asphalt-concrete, or other floors where flexibility is required. 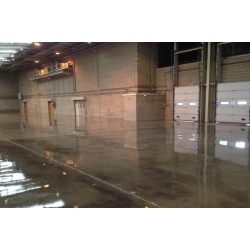 It can also be applied on cleaned, well adhering old epoxy floor coatings. 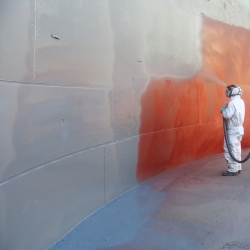 The coating offers protection against abrasion and impact and can be applied in a dry film thickness of 150-200μm (roller) or up to 2mm (rake) in one coat. If good U.V. and chemical resistance is required, Rust-Oleum 9600 Rust-O-Thane Polyurethane or Rust-Oleum 9200 Rust-O-Thane should be applied (except for 9211 or 9610 clear). General: remove oil, grease and all other surface contamination by alkaline or (high pressure) steam cleaning. The surface should be clean and dry during application. 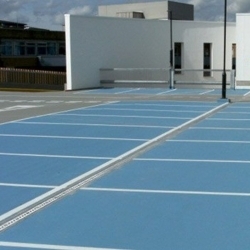 Previously coated surfaces must be in sound condition and should be roughened in order to achieve optimal adhesion. A test-patch is recommended to check compatibility. Concrete: new concrete should cure and dry for at least 30 days prior to the application of the product. Concrete curing compounds should be removed completely. All laitance, loose or unsound concrete should be removed by vacuum blasting or etching with Rust-Oleum Mathys 108 Surfa Etch Solution. 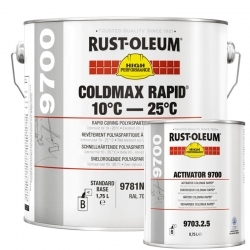 Irregularities should be levelled with Rust-Oleum 5170 Scrape Coat. Defects in the concrete should be repaired with Rust-Oleum 5180 Epoxy Repair Mortar or Rust-Oleum 5140 Light Duty Epoxy Repair Mortar directly after having primed with Rust-Oleum 5401 Epoxy Impregnation Primer (wet into wet). For details see the Product Data Sheets. 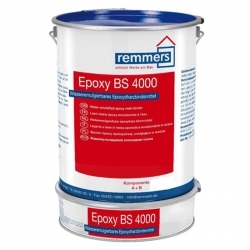 Very porous concrete should be primed with Rust-Oleum 5401 Epoxy Impregnation Primer. Asphalt-concrete: New asphalt-concrete should cure and dry for at least 60 days prior to the application of the product. 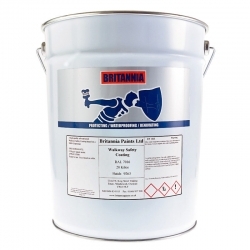 Defects in the surface should be repaired with the Rust-Oleum B95SL Flexible Self Levelling Epoxy, with fire-dried quartz sand mixed into a ratio of approx. 1:1 in volume. Stir individual components thoroughly before mixing them together. Use the boxing method or low speed mixer. Pour the material onto the properly cleaned floor and spread it out evenly with a wide comb, rake (Rust-Oleum 2 Blade Rake with Rust-Oleum Rake Blades) or a spreader with triangular teeth. Product Number Blade Number D.F.T. Then roll the surface with the Rust-Oleum De-Aeration Roller to release entrapped air and to promote the self-levelling effect. 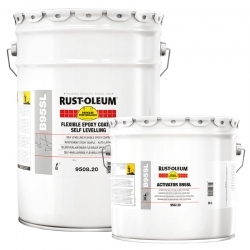 Clean up with Rust-Oleum Thinner 160. Temperature of air and substrate between 10 and 35°C and relative humidity below 85%. The substrate temperature must be at least 3°C above dew point. Maximum dry film thickness per coat: 2mm dry, equals 2mm wet. Check coverage regularly during application. Food should be stored separately or covered adequately during application of the coating. Some chemicals and solvents may cause discoloration and can affect the coating. The floor should be horizontal (max. 3mm per metre incline, according to DIN 18 202, Table 3, Column 4) before applying the material in order to avoid excessive differences in dry film thickness. Expansion joints should be filled with a flexible sealant. 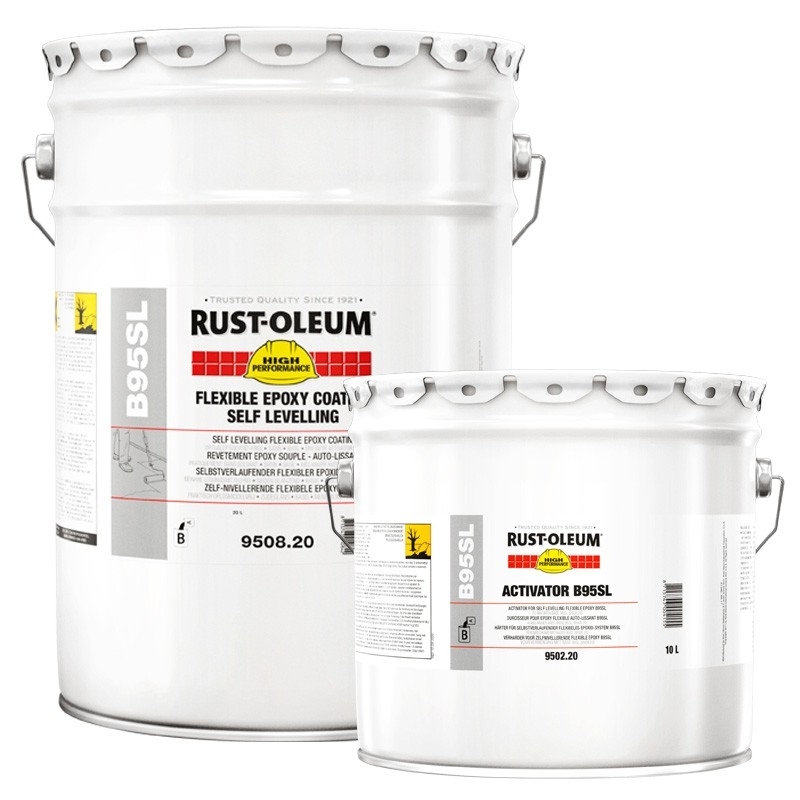 Rust-Oleum B95SL Flexible Self Levelling Epoxy should always be top coated with Rust-Oleum 9600 Rust-O-Thane Polyurethane or Rust-Oleum 9200 Rust-O-Thane. 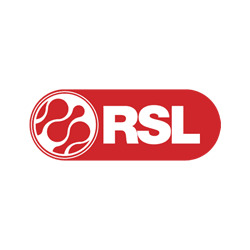 We do - RSL Resuthane™ SL23 - you can view available colours in this product by clicking 'Select a different colour'. Sikafloor 235 ESD is a 2-part coloured epoxy electrostatic, dissipative and tough elastic self-smoothing system for concrete or cement screeds with normal up to medium heavy wear for areas with requirements for a low electrostatic charge (Body-voltage) and dissipative surface. 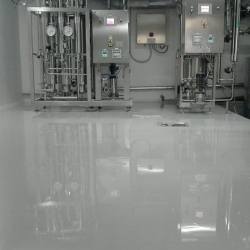 Sikafloor 230 ESD TopCoat is a two part, electrostatic dissipative, coloured water dispersed epoxy floor seal coat for use in conjunction with Sikafloor 262 AS N. Particularly suitable for areas with requirements for the lowest electrostatic charge (Body -voltage) and a dissipative surface. Sikafloor 16 Pronto is a two-part, fast curing seal coat based on reactive acrylic resins for the Sikafloor Pronto Modular System. Sikafloor Pronto Pigment should be used to colour Sikafloor 16 Pronto where required. This tough coating gives impressive slip resistance (aided by the polymer beads for grip), making this the ideal coating for walkways, verandas or balconies. Advantages Semi-gloss finish. Highly durable. Use on concrete and asphalt. Heat resistant.